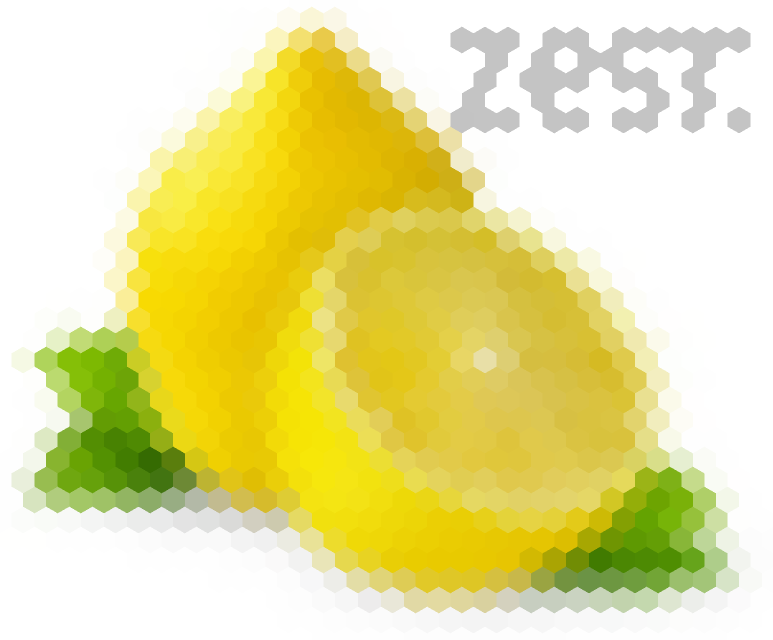 Zest is a web-based slice of life piece. It has some affinities to simulation games, but is also (mainly?) a story. I played it to several endings and got several achievements, though I did not complete the whole roster of possibilities. At first blurb this looks like it’s going to be a lemonade-stand sim, of the classic kind where you have to decide how much sugar and how many lemons to invest in each day. Then when you fire it up, the blocky text and graphics are in tune with the old-school Lemonade Stand game style, but now it looks like it’s going to be a sim about getting high and working a low-wage job, because there are meters tracking your wealth, your supply of “zest”, and your hygiene and intoxication levels. Showing up to work having exercised and smoked up a few times but not showered, for instance, may get you a chiding from your manager about your personal funk. But that is also a bit deceptive, because while you can play to manipulate those things, there are also lots of ways to slide out of the simulation into blocks of raw story. At times the juxtaposition of sim options and conversation, and the use of ordinary actions like showering to set an emotional tone, reminded me of Cart Life or, to a lesser extent, Papers, Please. There are a few direct echoes of Cart Life, like the fact that you can choose how to interact with a lot of people even more desperate than yourself. Zest doesn’t put the player through much by way of actual retail grind, though; and while your manager can be annoying, he expresses some concern about you rather than just telling you off if you show up to work completely high and unshowered. The presentation is also pretty sophisticated. In addition to the meters tracking your stats, the system plays with different speeds of presenting text, as well as multiple strands of text that appear simultaneously (e.g. to represent both what someone is saying to you and your own concurrent thoughts). It is really hard to tune this sort of thing so that it is not overwhelming to the reader, but I found it possible to track, and an interesting effect, perhaps because they did keep the text brief. Kudos to lectronice and PaperBlurt for the presentation quality. I am not personally all that into stoner humor, which may be part of why I had a hard time getting into Goodness’s previous comp entry Sam and Leo Go To The Bodega. Sam and Leo seemed to lead a rather dispiritingly undirected life. The protagonist of Zest felt like he had considerably more agency; indeed, the first time through I experimentally played to see if I could finish the story and not “zest” at all, and it turned out that that was not only possible but was accounted for. I sort of expected that pursuing the game’s other angle of going to church regularly was going to land me in a cynical satire of church life, but it was actually pretty light on anything like that and instead presented the text of some standard prayers. In any case, Zest gives a simulation from which there are assorted narrative escapes, as well the possibility of choosing to live your life in very different ways — and not always because you’ve worked hard and earned something better through horrible grinding, but because a window opened when you didn’t even expect it — gave the game a sense of the possibility of unearned grace. It felt surprisingly optimistic compared with Sam and Leo (and perhaps most of the rest of the work I’ve encountered by Goodness or PaperBlurt). Liz England has written about how she found the hygiene etc. meters to be wasted potential, but I thought they were entirely necessary: they establish expectations of what this game is going to be about that are then, mercifully, totally overturned by the content. If you take the churchiest of paths, living clean and going to confession and saying your prayers, and then go to Mass on Sunday, you end up sitting through a fairly long, non-interactive sermon about the miracle of the loaves and the fishes. While probably not in accord with the doctrines of the Catholic church, this sermon was not dismissive of the possibility of faith, either. The idea is that the loaves and fishes weren’t multiplied because God miraculously violated the law of the conservation of mass, but that the people in the crowd were shamed or persuaded into donating their own food which they had formerly been selfishly reserving for themselves. By contrast, the endings I reached by getting stoned a lot were tolerable, but generally (from my perspective) less desirable than the churchy ending, though I suppose that, say, working in a head shop might be a dream outcome for some players. The ease of entering that outcome surprised me, though, and perhaps the point is simply that the routine of a given rather unfulfilling life may be easier to leave than one thinks. 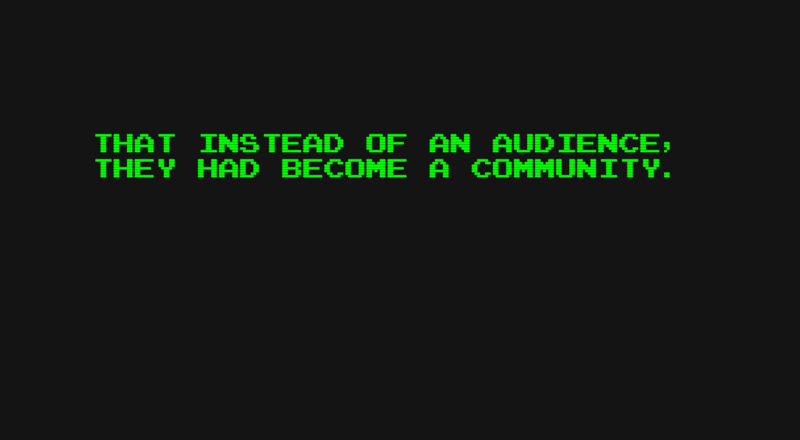 The question of how audiences become communities has been, shall we say, on my mind a lot lately, so this probably struck me more than it would have done at another time. The game doesn’t do anything to explore the hard part of this — the responsibilities that we bear towards our community, and in presenting that community to the rest of the world; the challenge of coming to consensus; the need to treat fellow members of the community with respect and kindness even when they’re not people we would have necessarily picked as friends, because that is necessary for the health of the whole body… well, this veers into writing a long sermon myself. I wouldn’t say that Zest is about those things; but it acknowledges the possibility of them in a way you absolutely would not have expected given the opening screen of the game. Zest has also been reviewed by Wade Clark, Liz England, PaulS, and (very briefly) by Michael Martin. Responses are extremely mixed. I think, paradoxically, that I had an above-average experience with the game precisely because I was so resistant to the initial premise (“let’s buy lots of weed! and smoke it!”) that I intentionally played against the grain with my determination to work out a lot and go to church instead. In a lot of games, playing against the grain just gets you a bad experience, and it’s kind of daring to make a game where playing it according to its apparent intentions will result in a banal and mediocre playthrough. But that’s also kind of the point, I felt. I tried getting the OD ending, at which point you land before the mercy seat and god tells you he knew you not and you’re cast into hell. Within the world of Zest, God, Heaven and Hell are all very real, reinforcing that even if the church is not what you might like for it to be, there is truth in faith. While you’re given the opportunity to wallow in drug abuse, maybe escape from such a life, rather than its celebration, is the point?